Otis at Loganberry Books is ready for Halloween. Narrow Gauge Book Cooperative, Alamosa, Colo.: "I solemnly swear I am up to no good. We're getting ready for Spooky Story Time!" McLean & Eakin Booksellers, Petoskey, Mich.: "Happy early Halloween!" Muddy Water Bookstore, Navasota, Tex. : "The Zombie crawl was a blast. Sadly, I didn't get many pictures. We had for the children Goosebump Punch and yard gnome popcorn! For adults we had a wonderfully disgusting shot called Zombie Brain Hemorrhage and bloody severed fingers!!!!" Foggy Pine Books, Boone, N.C.: "#HalloweenBooks for all ages! Get into the #SpookySpirit with a nice #HorrorNovel or #Read a cute rendition of #Dracula to the kids for a #ChildFriendly #Spooky book. We have plenty more where that came from on our horror book #Display in the store. Come check it out!" Bogan Books, Fort Kent, Maine: "Are you cringing at the thought of rotten teeth that might haunt your tricksters or treaters? Come get a Halloween or horror book at Bogan Books for 25% OFF and give your ghoul or goblin a treat they will love and will be kind to their teeth!" Loganberry Books, Shaker Heights, Ohio: "Happy #nationalcatday from #bookstorecat Otis! 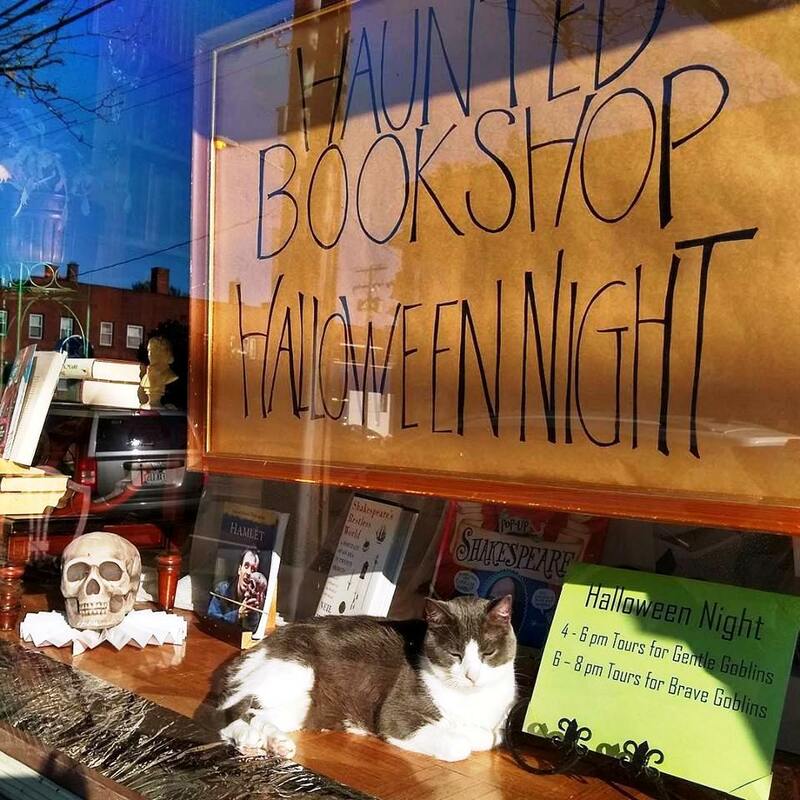 He hopes you'll brave the gloomy October weather for a fantastic free Haunted Bookshop tour on Wednesday night (10/31) anytime between 4 p.m. and 8 p.m. Come in costume, leave with candy--and a Halloween experience you won't forget soon!" The Ripped Bodice, Culver City, Calif.: "HAPPY HALLOWEEN (Bahahahahaha. We know this is a terrible photo. Sometimes running a business means you're going going going and don't really get a chance to do a whole photo shoot. But we wanted to show off our amazing costumes.)" Nantucket Bookworks, Nantucket, Mass. : "Kritter Klips! Not sure what to go as for Halloween this year? These Kritter Klips at Bookworks are the perfect answer for you and your friend!" Powell's Books, Portland, Ore.: "Spooky can be fun, but sometimes we want to read books that are only a little spooky. Check out our kids' display of (Not Too) Scary Stories, at our downtown location!" Storysmith Books, Bristol, England: "Only been open 3 hours but I think we've had our oldest customer." The Book Seller, Grass Valley, Calif.: "Halloween is just around the corner! We've been busy decorating the store and getting costumes ready for the annual Downtown Grass Valley's Safe Trick-or-Treat event next Wednesday. Until then, if you're in the mood for some spooky reads we have many staff recommendations!"